Bridgestone, which started making tires and golf balls between the wars, began making pedal cycles - the most appropriate form of transport for that period of economic crisis in 1946. Helped by the rise of the economy, Bridgestone launched in 1958 a little 50cc machine with forced cooling and a pressedsteel frame. The 50 was followed by a short-lived 125 in 1963, but it wasn't until 1964 that the marque took on its real dimension as a manufacturer of motorcycles with the 90cc illustrated overleaf. 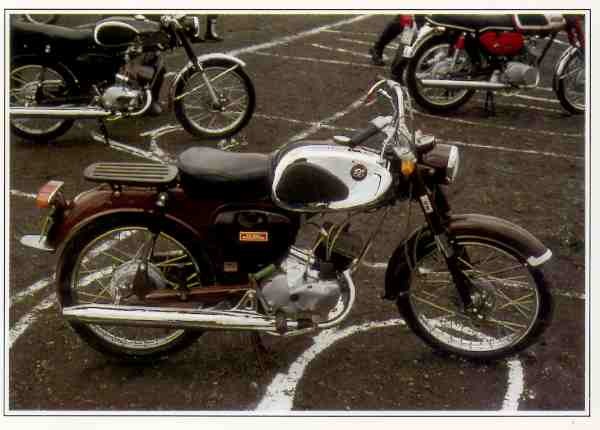 Though the first version of this little two-stroke looked really utilitarian, it was highly evolved technically, with induction by rotary disk valve its major innovation. This technology remained characteristic of the marque until it ceased motorcycle production in 1968 to concentrate on its rubber products. In the meantime, Bridgestone produced a sober but always interesting range, with a 180cc twin-cylinder in 1966 and- especially- a 350 along the same lines, launched in late 1967, and essentially destined for the US market. The marque also appeared in Grand Prix the same year, with a superb 50cc twin-cylinder; its name continued to feature in racing until 1973 with a 125 twin prepared in Holland by Jos Schurgers, though this got no input from the factory except its decals! Expensive, but better-performing than its rivals, the 90 EA1 established Bridgestone's image in japan.